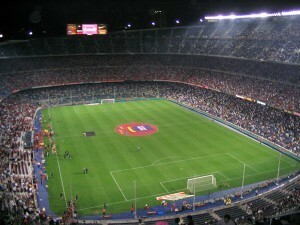 One of Barcelona´s highlights is Camp Nou, the football stadium of FC Barcelona. But how accessible is it? We visited recently to find out. On our arrival we were taken to the museum level by the lift, which is big enough to accomodate one wheelchair, and then escorted over the bridge into the museum itself. The museum is fully accessible and has been very well thought out for the disabled visitor, with tactile touch screens and low well lit display cabinets. There are also fully accessible disabled toilets inside the museum. To the left of the museum is an accessible viewing platform with a wide, gently sloping ramp with a view down onto the pitch to allow you to see where all the excitement takes place. We then carried on up to the next level where they explain how FC Barcelona is ‘more than a club’. This area is accessible by two long modern wooden ramps which some wheelchair users may need some assistance with. Again, this exhibition is totally flat and fully accessible to disabled visitors. As I have explained above, the museum tour is fully accessible. However, the Camp Nou experience is not. There are many flights of stairs going down to the changing rooms, press and VIP rooms and the pitch itself. However, the friendly, helpful staff explained that for those with limited mobility it is possible to eliminate some of the stairs with an alternative lift but you would still need to be able to negotiate the rest. 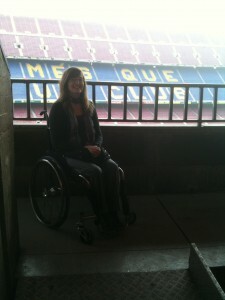 To summarise, even if you are not a football fanatic, FC Barcelona is a must see on a visit to the Catalan capital.